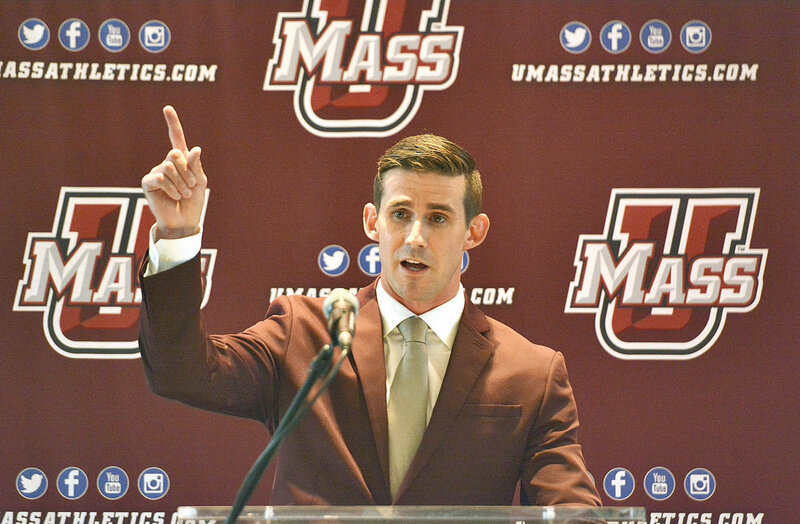 UMass will kick off its first spring practice under new coach Walt Bell this afternoon at 4 pm at McGurik Stadium. There is great anticipation for the upcoming season. Bell has hired a new staff and is installing an uptempo offense and an aggressive defensive scheme. Bell is also inheriting a young team that lost a lot of talented seniors most notably. wide receiver Andy Isabella, running back Marquis Young and quarterbacks Ross Comis and Andrew Ford. The Minutemen are also starting over along the offensive and defensive lines. Bell and defensive coordinator Aazaar Abdul Rahim will have their work cut out as they try to identify who can fill some of these holes. Luckily, they have 15 practices between now and April 20th to figure it out. Here are five things to watch for as spring practices begin. 1. New coaches, new schemes: As mentioned earlier, UMass will be operating out of an uptempo spread offense and defensively, the Minutemen will run an aggressive, multiple defense that will feature 40 and 30 fronts and pressures. Offensively, Bell wants to push the pace. He will run a variation of Willie Taggert’s Gulf Coast offense. The Minutemen will be in a lot of 10, 11 and 12 personnel groupings. They will emphasize pace and communication this spring. Defensively, the onus will be on alignment, assignment and playing fast. Installing a new offense and defense takes time. The coaching staff will do a lot of teaching this spring as they try to get the base schemes in. 2. Identifying the starting quarterback: It will not be easy filling the shoes of Andrew Ford and Ross Comis. Both were productive starters in Mark Whipple’s offense. Bell prefers a quarterback that can pull the ball and throw it on RPO’s or pull it and run off of certain run plays. Redshirt junior Michael Curtis and redshirt sophomore Mike Fallon will battle freshmen Josiah Johnson and Andy Pallotta for the starting quarterback job. Incoming grad transfer Andrew Brito will also be in the mix. He is undersized but athletic and could be a good fit in Bell’s offense. UMass has plenty of quality options at quarterback but they will take time to develop. 3. Replacing multiple starters along the offensive lines: The Minutemen have to replace several key starters along the offensive line. Guards Jake Largay and Lukas Kolter have graduated and center Derek Dumais transferred. Tackles Larnel Coleman and Ray Thomas-Ishman are the only returning starters. UMass wants to be more athletic at guard because of their one blocking schemes. Center Jaylen Larry and guards Mike Yerardi and versatile grad transfer Bryce Wade will be in the mix at guard. Freshman Xavier Graham will also get a look at guard in fall camp. UMass will have to figure out who their starters will be prior to traning camp. Getting their starters in place will be key. 4. Replacing Andy Isabella and Marquis Young: It is virtually impossible to replace the production of Isabella and Young. Fortunately, UMass has plenty of young skill on hand. Bell and his staff need to find out this spring who will emerge and take the reigns when it comes to being playmakers. 5. Setting the tone for 2019: Spring ball sets the tone for the next season. Bell pushed back the start of spring practices to focus on recruiting. Now that he has his class in place, the focus will be on football for the next month. The Minutemen need to get ready for the season and their season opener at Rutgers. Spring ball sets the tone for fall camp so Bell and his staff need to get the most out of these practices.